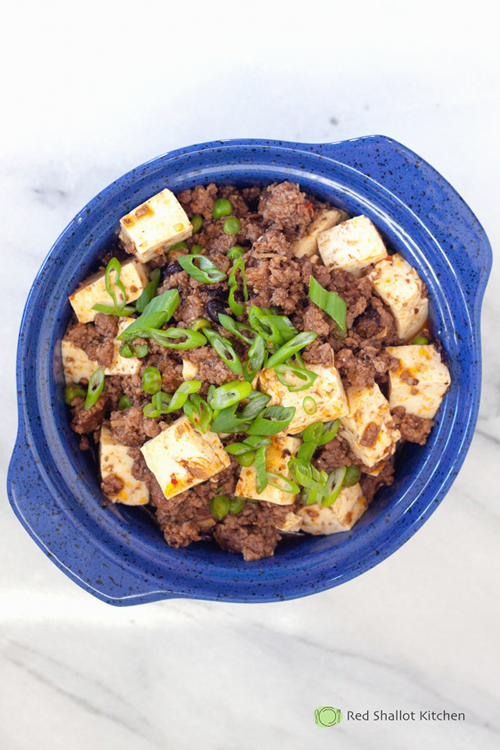 Mapo tofu, to me, is comfort food. This spicy dish with fermented bean base, combined with mouth-numbing Sichuan peppercorns, can be found in most Chinese restaurants across the country. But seriously, what not to like? There are 3 important ingredients for cooking authentic Mapo tofu: doubanjiang which is chili bean paste (one of the most important ingredients in Sichuan cooking), and dou-chi, also known as fermented black beans, and lastly Sichuan peppercorns. Omit any of these ingredients, and your tofu will not be the same, I'll tell ya! Poaching the tofu prior to cooking will help to make your tofu more tender. Simply soak tofu in hot salted water for about 3 minutes, drain and slice/cube. In a large skillet, heat 1 tablespoon cooking oil over medium-high heat. Cook ground meat until done, transfer to a plate and set aside. Add sesame oil into the skillet. Fry garlic, ginger, doubanjian, dou-chi in the skillet until fragrant. 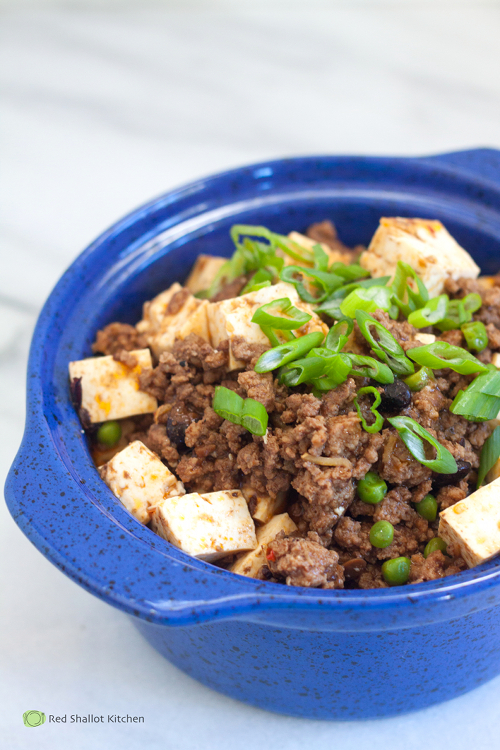 Place tofu cubes, green peas and ground meat into the skillet, mix gently so the tofu don't turn mushy. Pour chicken broth into the skillet. Add soy sauce and ground peppercorn, and let the liquid to boil. Mix water and cornstarch in a small bowl, stir into the tofu mixture. Simmer and let the liquid thickens, about 2-3 minutes. At this point, taste the dish to see if additional salt is needed. Transfer dish to a serving plate. Garnish with chopped green onion and serve hot with steamed rice. Atractive game Crackdown 3 is coming soon after few years. I read your article Completly very good stuff Included. Thanks for this good doing. Happy Memorial Day 2017 is celebrated on 29th May in 2017 in the United States. i have read your article very nice information for product recipe,thanks for sharing is is with us.